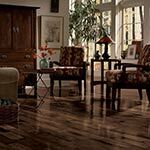 For centuries people have sought the natural beauty of wood floors. At one time wood floors were fairly simple. The wood planks were cut from large logs, milled into planks, nailed down, stained and then finished in your home. These early floors were mainly 3/4" thick, 2-1/4" wide, solid strip planks that were waxed after staining. Today, homeowners have more choices than ever before from Olde World to classy contemporary to rich exotic styles. 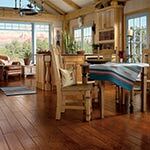 Combine all these exciting new offerings with the latest wood finishes that are more durable and easier to maintain and it’s no wonder so many people are starting to use hardwood floors throughout many rooms in their homes. 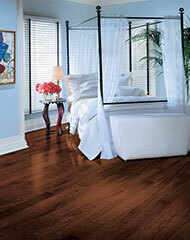 Nothing can add beauty and warmth to your home like quality hardwood flooring. Available in many different sizes, qualities, and species, it's easy to get confused while shopping. 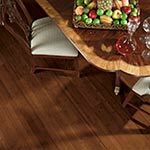 At Specialty Flooring we can help you through the process of selecting exactly the right hardwood floor for your home.